Fancy That! (:: What a great day! I woke up this morning and was all blah.. went to my first job and time just drug on.. not very fun. I left and went to my second job. I was still in a blah, whatever type mood. I picked up my check from my old job, went to the bank and put money into my account so I could go and get some well needed gas. I then went to the gas station where you have to pre-pay. My card wouldn't work! BOO! They tried several times but still nothing. I was super bummed and was like well, okay guess I'll drive back to the bank just get some cash out and come back. (Thinking in my head, I hope I have enough gas to get there and back!) When all the sudden the sudden the man behind me who is probably in his late thirties asks, "Is that white car yours?" I replied, "Yeah..." he then asks, "How much were you going to put in?" I then replied again, "Twenty five..." (I was kind of like uh why are you asking this?) He then said, "Okay, cool. I got you covered." Then looked the the cashier and said, "I'd like twenty five on pump two." I got all embarrassed and said right away, "I can pay you back, let me run to the ATM to get some money." He looked at me and smiled and said, "Oh no worries, I like helping people out!" I then thanked him and went on my way.. (I think he thought I had no money and was a single mother cause I had the two year old that I nanny with me.. ha ha!) That sure did brighten up my day! It's good to know that there are good people in this world! Has a stranger ever done something like that or similar for you? 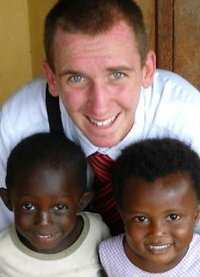 Another good thing that happened today is, when I got home from work it was time to receive my email from my missionary! BEST EMAIL EVER! It has made my night and my whole week! He's such and amazing person! :) I cannot wait until he's home! It's getting so close! Every time I think about it I get all excited and want to just dance my pants off! AH! Only two more months! I can't wait! I am hoping time goes by super fast! I'm out of patience! ha ha! Here's a cute picture of the missionary! I think the kids he's with are so precious! That dude was so nice. That was really sweet. No one has ever done that for me...but then again, I don't drive. lol! Ha ha! He was so sweet! (: Makes me want to do something nice for someone like buy their groceries or something? ha ha!